Coral reefs seem delicate, but when they are healthy they can take a lot of abuse. I’ve seen corals recover from severe hurricanes and even volcanic eruptions. 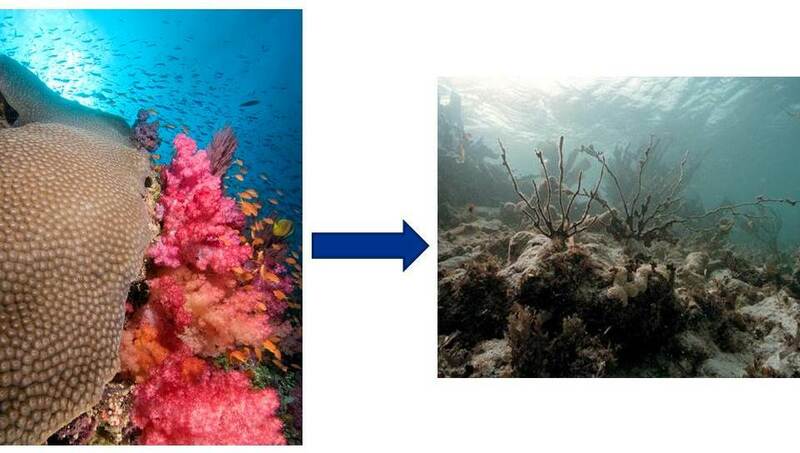 But coral reefs can also transition suddenly from colorful, vibrant ecosystems to mere shadows of themselves. Decades of scientific investigation have shed a lot of light on this, and in a recent publication, my colleagues and I summarize a lot of the data that have been collected on Caribbean coral reefs to identify where these dangerous “tipping points” are. This work is part of the Ocean Tipping Points project, a collaboration between several institutions aimed at finding tipping points in all kinds of marine ecosystems so that managers can implement measures that will keep these ecosystems well away from the brink. In 1987, I lived on a lighthouse straddling a healthy coral reef for several months, trying to understand how it worked. The reef was alive with dozens of fish species and brightly colored corals. I could see (and hear) hundreds of parrotfish, surgeonfish, and aggressive little damselfish mowing down algae all over the reef. The grunts were doing their daily commute between their nutrient-rich feeding grounds in nearby seagrass meadows and their shelters within the reef. I got to know the resident barracudas, stealthily waiting for a chance to snap up a meal. From atop the lighthouse, I could watch sharks move in and out of the reef, along with the occasional eagle ray or dolphin. My reef had lots of biodiversity, and enough fish in each “functional group” (e.g., grazers and predators) to carry out their ecological roles. Most of it was covered with living coral; seaweed was scarce. These are the characteristics of a healthy coral reef, one that can produce many different kinds of ecosystem goods and services like sustainable fisheries and dive tourism. A couple of decades later, it’s obvious that coral reefs are not faring very well. Climate change has caused mass bleaching around the world – where corals lose their colorful microscopic partners and starve. Raw sewage is routinely dumped onto reefs, which are very sensitive to the nutrients in the sewage – in this case, it is too much of a good thing as the extra nutrients stimulate seaweed growth and allows them to overgrow the corals. It turns out that sometimes these changes are gradual, but often they are quite sudden and dramatic, when reefs cross over what we call an ocean tipping point. Tipping points occur when small shifts in human pressures or environmental conditions bring about large, sometimes abrupt changes in a system. Such tipping points are ubiquitous – they can be found in human society, physical systems, ecosystems, and even in the planet’s climate system. Because it is often very difficult for ecosystems to recover after a tipping point is crossed, the Ocean Tipping Points (OTP) project was formed to characterize tipping points in ocean ecosystems and provide ocean resource managers with practical guidance to help avoid abrupt changes. EDF is a partner of OTP, as are the National Center for Ecological Analysis and Synthesis (NCEAS), the Bren School for Environmental Science and Management, the Center for Ocean Solutions, and the National Oceanic and Atmospheric Administration (NOAA). Healthy ocean ecosystems have checks and balances—grazers control seaweed growth, predators control grazer populations, etc. – and redundancy and complementarity (different species do similar things but in slightly different ways). These attributes help them stay away from tipping points. Tipping points have been well documented in coral reefs, but they occur in many other ocean ecosystems too. For example, luxuriant kelp forests that support marine mammals and a myriad of other species provide us with various ecosystem services like seafood, agar (sugar made from kelp), recreation, and sheltering the coastline from waves. However, these habitats can become barren very rapidly when they reach a tipping point. This happened in the 1800s when fur hunting became prevalent—decreasing the sea otter population. With fewer sea otter to consume urchins, urchins became overabundant, and overgrazed the kelp. Fortunately, science is providing insights into the factors that make ocean ecosystems more capable of resisting these kinds of changes, and more able to bounce back when they are damaged. Our new paper synthesizes hundreds of data points collected over many years from over 20 countries in the Caribbean Sea. We found that, however counterintuitive it may seem, coral cover is not the best indicator of coral reef health. Once coral cover has visibly declined, the data suggest that many other changes may have already occurred that are likely to make recovery very difficult. Fish population status seems to be an earlier and more useful indicator of coral reef status. We were also able to quantify tipping points for coral reefs in the Caribbean, based on these data. Coral reef managers can simply compare fish density in their coral reef to densities associated with these tipping points to assess the risk of ecosystem collapse. They can also use the tipping points to guide management aimed at keeping the system in a “safe operating space,” where enough fish are left in the system to maintain the reef in a healthy state while providing “pretty good yields” – not the maximum amount of yield possible, but enough to sustain a fishery while hedging against the risk of collapse. While tipping points should be determined for each reef, the generalized tipping points we found in our study can provide useful guidance for risk assessment and precautionary management. It is easy to despair when thinking about coral reefs. They are sensitive to many different kinds of threats, and they are subject to all of them: we are losing them very quickly. But the data show that many of the coral reefs in the Caribbean with marine reserves have large fish populations, healthy corals, and many other indicators of good health. 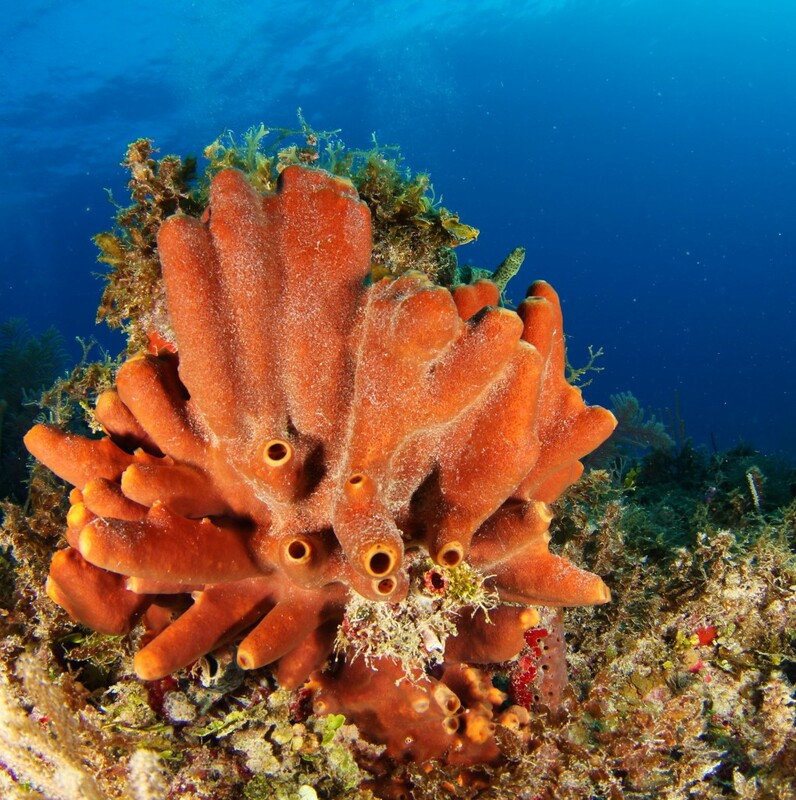 The Cuban reefs that we have been fortunate enough to visit are absolutely spectacular, and remind me of my early days diving on Caribbean reefs that were covered with living coral and swarming with fish and urchins doing their jobs keeping the reefs healthy. These healthy reefs are the hope of the Caribbean – they will provide the seeds of recovery, if we manage to reduce threat levels and keep reefs within their safe operating spaces, away from tipping points.